WELCOME to the website for S.V. NECHTAN and her crew! Hi! We are Tom and Sue McNaughtan and this website is an online journal, describing our voyage on our sailing boat "Nechtan" from Scotland to Australia. We left our jobs as software engineers at the end of April 2003 and sailed out of Peterhead harbour on 22 June, having sold our cars, packed our worldly possessions away and rented out our house. This was the culmination of over 10 years planning, saving and preparing the boat for long-distance voyaging. "Nechtan" at Ua Pou in the Marquesas, 2005. 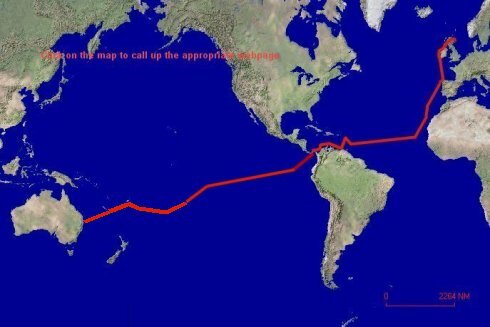 Since then we have crossed the Atlantic and Pacific Oceans, arriving in Australia in November 2005. To see what we got up to along the way, either click on the map below or select one of the countries from the menu on the left of each page. We have listed the countries in the order in which we visited them. A more detailed map for each page is available by clicking the world map icon to the left of each page heading. Obviously this website was set up in what many of you would consider to be the dark ages of website design. Consequently, many years down the track, some features are no longer supported by the more modern browsers. We considered updating, but have decided that the deficiencies are relatively minor and hopefully should not detract too much from your viewing experience. Do however check in every so often for a link to a new, more modern website, when we head off again one day!